Landing at Erramanga, One of the New Hebrides, William Hodges, 1775-1777, National Maritime Museum. 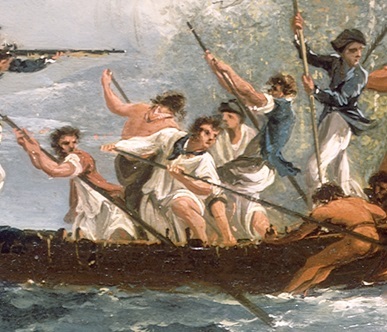 According to the National Maritime Museum, this was part of a series painted by Hodges to document the various adventures of the famous explorer Captain James Cook to accompany his writings when they were published in 1777. Cook's voyages are extremely well documented and incredibly dramatic. Of particular interest to us is the unique perspective they give us a picture of sailor's life in a very different setting. This is the first of the images I've examined that is set in the Pacific, rather than the Atlantic or Mediterranean. At the stern of the jolly boat, a frightened looking tar, probably the coxswain, clutches his firelock. He wears a black round hat with a narrow and upturned brim, a black neckcloth, white trousers, and a brown short jacket. Interestingly, he appears to be wearing a brown leather belt outside of his jacket, possibly holding up a cartouche box. In the center of the jollyboat is another jack aiming his firelock at the native warriors. I would guess by his sword, and the gold trim on his hat, that this is an officer. At the bow a number of sailors push their oars into the sand in an attempt to escape. One of them is shirtless with a light red or orange neckcloth. In front of him at the center is a lad in a white shirt, black neckcloth, and petticoat trousers. Oddly, a pair of their mates are wearing long and open sleeved waistcoats or possibly jackets of blue and brown. I hesitate to conclude they are jackets as the garments are rolled up well above their elbows; this would be rather difficult with your typical woolen jacket. 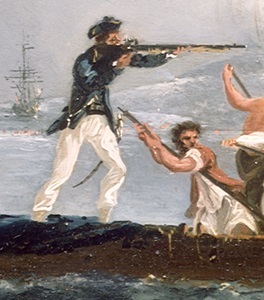 The closest seaman to the natives and standing at the very tip of the bow, is a tar in a black cocked hat, white trousers, and a blue, unlined jacket.